So PRETTY and HAPPY!!! You have creativity of thousands of people in you head, I love the card, TFS. 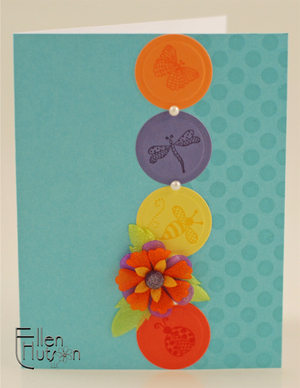 Love this card - love the colors, love the bitty bugs, love the backgrounder, and love the flower. I hope you'll share the how-to or the source for this awesome blossom. Thank you so much for sharing your great ideas and wonderful talent. I love your cheerful colors and cute bugs!! What a fun card!! Love it!! I love the bright colors on this card. One bug in each circle with the circle bg is adorable! Thanks! What a fun, bright & cheery design, Ellen -- just perfect for those Itty Bittys! Oh!! Such a cute card. oh, what a lovely card! Couldn't you use versamark for the bugs? If you didn't have the colors to match would that work? Thank oyu for the tips. Always look forward to your creations. Wonderful Card - love the bugs...but how did you create the flower? It's beautiful! This is so cute! I hope I have time to give this a try tomorrow! 2 questions- one, did you make the adorable flower? two, is the sentiment inside the card? Sorry, if this is a "duh" quesiton. It's been a long day!